In this previous guide to tiangge shopping in Taytay, Rizal, we answered most of your questions. This time, we decided to go an extra mile to show you the affordable clothing finds that await you in this shopping paradise. With a total budget of P1,200, I took on a self-imposed challenge to create 10 stylish looks from the Taytay Tiangge. I accepted the challenge before I did the math and soon realized that this means I get to spend only P120 per look, on average! But because I am no quitter, I’m putting Taytay’s hype to the test. Excited to see how I did? Let’s begin! This yellow lace romper was an absolute steal at P170, mainly because of the quality of the garment. This is definitely one of the pricier buys—at P170, pricey? !—but it’s one of those rare times in the Taytay Tiangge when you have to give in because it’s just that pretty. The culottes are as “free size” as they can get, with their wide leg pants and garterized waistband. They also come with a matching tie-around belt for a more tailored finish. With all of those details, and this gorgeous blue-green shade, my P100 was beyond sulit. The floral crop top, on the other hand, was definitely on the smaller side, but for only P30, I’m still quite impressed! To support my case that the Taytay tiangge is just as on-trend as mainstream shops, the next three looks will feature my favorite trend right now: Gingham. Kicking it off with this top: a simple blouse with butterfly sleeves. Scored for only P60. My world stopped when I spotted this all-gingham stall. It resumed spinning when I saw this ruffled pseudo-wraparound Gingham skirt in red. So much character for only P100! This look reminds me of Allie from The Notebook, with its powder blue Gingham print, silk ribbon straps, and ruffled hem. 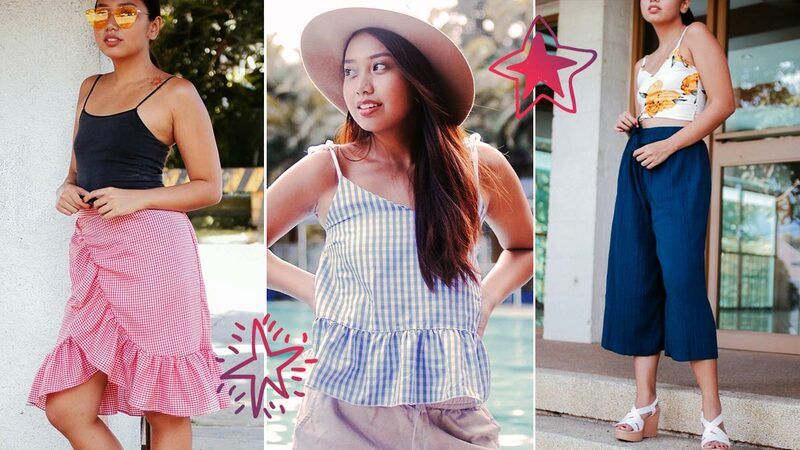 For a total of only P110, this summer look is going to be a definite closet favorite year-round. This look may have gone overboard with prints, but I just thought these two separate purchases had to go together. It reminds of what all my friends look like post-Bali trip. A daring beach top, paired with some laid-back high waist bottoms, can really bring out that just-got-back-from-an-island vibe. And for only P100? Sold! One other amazing thing about the Taytay tiangge is that you find better deals when you shop in bundles! This crop top was purchased along with the top from look #2, and these shorts along with the ones in look #5. I bought them on a 3 for P100 discount, and saved a couple of pesos by doing so! Don’t underestimate your barya—in Taytay, they go a looong way! If you’re not into tropical pieces, I found that you still have options at the tiangge. Take this bomber jacket, for instance! At P140, it’s a perfect piece for layering in the Philippines! It’s like donning a cardigan, but with the extra flair of a bomber jacket. Win-win! Thinking of stocking up on closet staples? Go for it! You can wear this dress from day to night, whether layered with a shirt, accessories, or just on its own. Who knew a P130 purchase could have so many uses? I don’t like playing favorites, but this low back little black dress definitely tops my list of my Taytay tiangge purchases. First, the fabric is amazing—definitely not the tiangge material I’m used to. Second, I’m obsessed with the extra layer just peeking from underneath! Lastly, that low back is just everything I need it to be. Ready to cop that off-duty Gigi Hadid look? I know I am! So I did the final math, and I had spent a total of P1185 to complete these 10 stylish looks. I’m pretty pleased with my Taytay tiangge shopping haul, and I already can’t wait to go on my next one! What about you, CGs? Do you think you can take on the challenge?